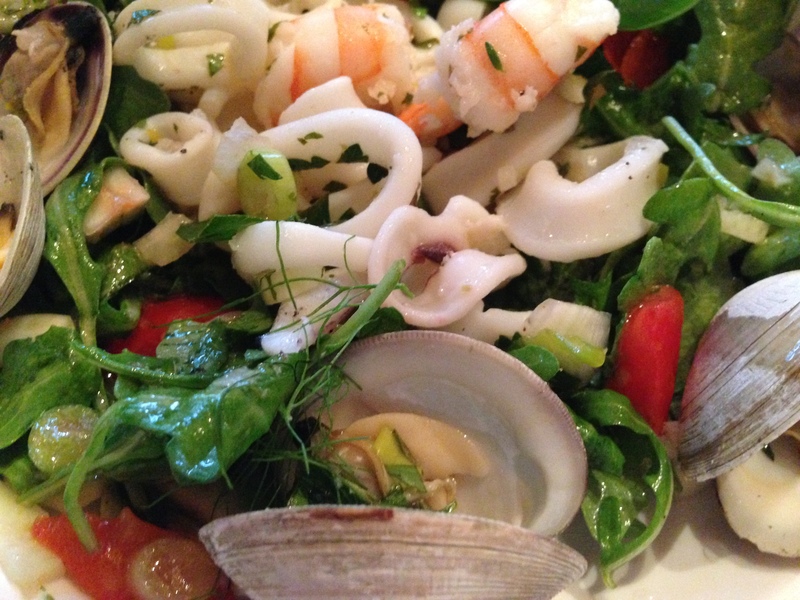 calamari – Don't Forget the Cream! There are times when salad is good, and there are times when it is fan-freaking-tastic. This salad is of the second sort, at least I think so; my husband, on the other hand, thinks calamari is “squishy” so he does not enjoy it. In fact, he doesn’t like any kind of squishy food: marshmallow or Fluff, its first cousin, commercial whipped cream, meringue, crawfish, you know, things that go squish, but delving into that topic any further requires another sort of professional…but I digress. And it’s fairly simple to make. No, its very simple to make. 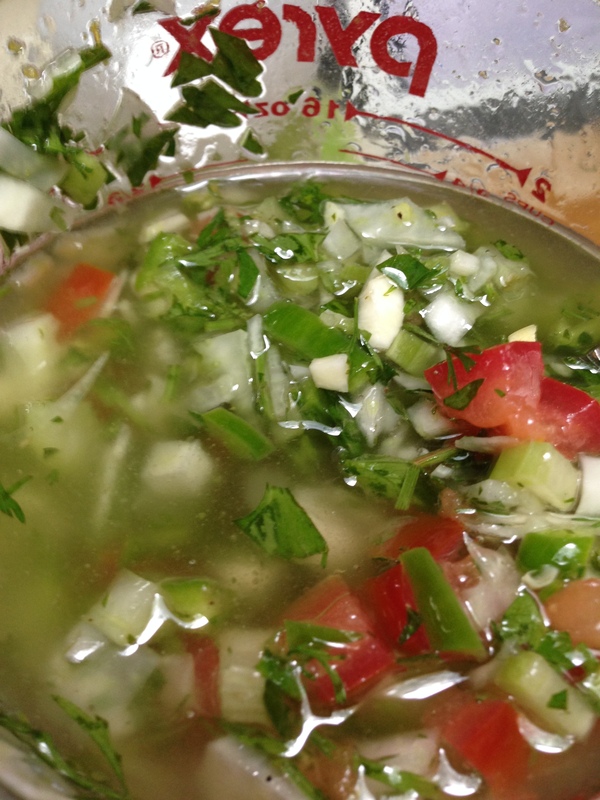 Make your court bouillon, which means “short stock” and is pronounced “coor-boo/yoh~” (for an audio of the pronunciation: http://www.howdoyousaythatword.com/word/court-bouillon/) clean your seafood and construct your salad greens. Voila! More French words and better yet, a nice entree or side dish. **See the usual disclaimer below. 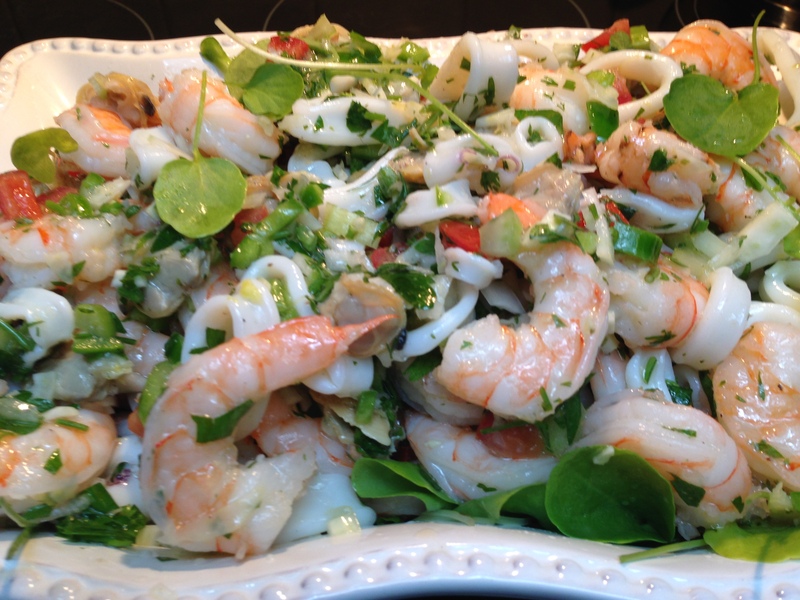 Adapted from Foodnetwork.com/guy fieri chilled Italian seafood salad. **Disclaimer: I consider all recipes “advisory opinions”. Some times the adivce is good and you learn the good; sometimes the adivce is bad and you learn from that too. Until I grow a new fruit that this earth has never seen, theres a good chance that all of my recipes began somewhere else. And even if it didn’t, I’m sure you can find one so similar that it will be hard to tell which is the chicken and which is the egg. Nonetheless, I will always give credit to the first source I began working from, and I will always us the phrase “adapted from…. [credit inserted here]. I generally make a recipe 3 or 4 times to tweak it to the way the I like it. I expect you to do the same. Food is sustinance, sustinance is necessary for life. Enjoy yours the way you like, and I’ll supply a few ideas.